Unlike some streaming services, such as The Roku Channel, which offers free movies with ads The Roku Channel Brings Free Movies to the Web The Roku Channel Brings Free Movies to the Web You no longer need a Roku device to watch Roku's free, ad-supported movie channel. Because The Roku Channel is now on the web. Read More , Netflix charges cold, hard cash. Which means users don’t want to see commercials interrupting their binge-watching marathons. Netflix didn’t get the memo. 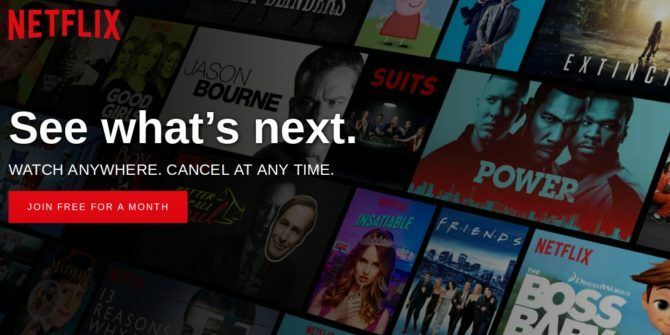 According to TechCrunch, Netflix is currently testing whether it’s a good idea to show users ads for its own shows in between episodes. Testers report that after an episode ends, a video for a Netflix Original will start playing, with the onus on the user to skip it. While these video promos are skippable, they’re still an unnecessary intrusion on a binge-watching session. And seeing as the capacity to binge on shows without any interruptions is one of the main reasons to subscribe to Netflix, this hasn’t gone down too well. Netflix’s intentions may be pure, and the company is merely trying to help its users find new shows to watch. But we doubt it. Netflix is spending a lot of money producing its original programming, and to justify that it needs people to watch those shows. After the complaints on social media, plus the articles (such as this one) that followed, we suspect this test will come to an abrupt end. However, the streaming service is bound to keep pushing the boundaries to get more users watching more Netflix Originals 10 Awesome Netflix Originals You've Probably Never Heard Of 10 Awesome Netflix Originals You've Probably Never Heard Of Alongside the headline-making shows such as House of Cards and Stranger Things, there are countless Netflix originals that may have passed you by. Read More . While from time to time I binge watch a series, one feature I like is how one episode merges into the next after several seconds. However, if I get this right, when one episode is finished, does that mean it will show an ad in between? In other words, will I have to physically stop the ad in order to continue to the next episode? If this is the case, then why am I paying $15.99 a month when the whole purpose of paying for Netflix was to escape ads in the first place?